Looking for easy to make Christmas ornaments? The 10 Days of Christmas Ornaments for Sewers is a great list of sewn Christmas ornaments to make. Have fun adding some decorations to the tree. And don't forget that ornaments are a great gift or stocking stuffer! The extra effort you put into these gifts will make them that much more special. Easy and fun the 10 Days of Christmas Ornaments are an excellent way to keep busy for a purpose! Take on another easy project with these Stars and Heart Felt Ornaments. They're adorable additions to any tree. Fast and easy to make, and with an excellent price tag, you can fill up the empty branches and begin a theme for this year's holiday. 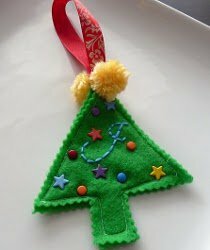 Another cost efficient decoration for day three, the Felt Ball Christmas Ornament is a great project. Keep the sewing up with this easy creation. 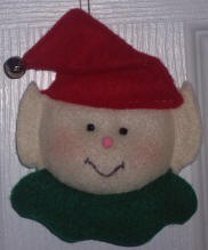 Keeping with the felt theme, the Elf Christmas Ornament continues the 10 days of christmas ornaments by shining light on the Santa's little helpers. Adorable and amusing, this one is a great gift idea to bring joy to someone else's holiday season. A hilarious addition to the list, and your tree, anyone that receives this gift or catches a glimpse of it on your evergreen's branches will have a chuckle. After the premier of Shrek, the Gingerbread Man will never be the same, Half-Eaten Gingerbread Man Ornament proves that. Here's one for the kids to create! Mini-Monet Christmas Ornament is a great gift to the teachers to let them know you appreciate all they have done, plus it's adorable if you want to trick the kids into making your very own keepsake. 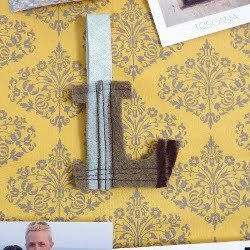 A super cheap and easy craft, a Monogrammed Felt Christmas Tree Ornament is the perfect way to make some personalized Christmas ornaments. So is the Crafted Felted Wool Monogrammed Ornament. With a slightly different feel, it still gives you a chance to include everyone while giving them special attention throughout the tree branches. Getting tired yet? We're almost done with the 11 days of Christmas Ornaments, but we have another thrifty one to add to your collection! 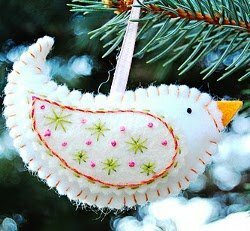 A Birdie Ornament is cute and seasonal and compliments the felt theme we've acquired over this challenge. 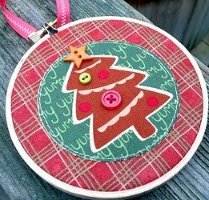 The Embroidery Hoop Ornament can really utilize your sewing skills to decorate your tree. 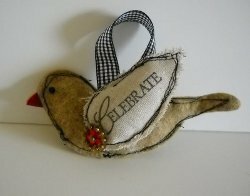 To conclude the 10 days of Christmas Ornaments for sewers, the Fabric Scrap Bird Ornament is a great source of inspiration. How many piece of fabric have you collected over the years? Enough to make one of these for everyone on your Christmas list I'm sure. So Dig through there and see if you can find any that spark your interest!